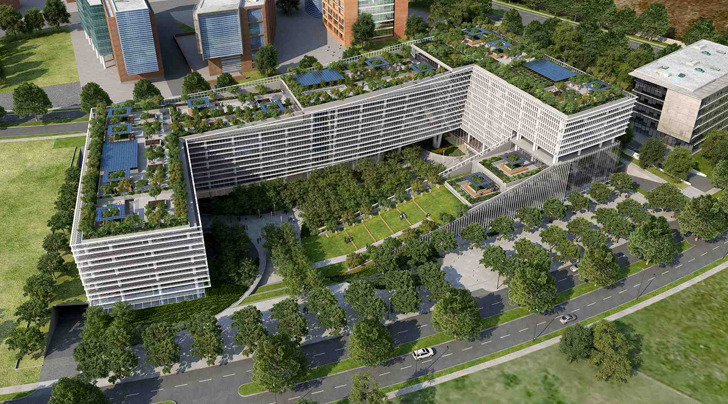 The LEED-pending World Green Center in Chile maximizes the amount of public spaces through sustainable design and a sprawling green roof. Santiago-based cCe Arquitectos designed more than 72% of the ground surface as green space while the completely landscaped roof is covered with shaded terraces and gardens that reduce the heat island effect. Passive design is incorporated within the façade, which reduces solar radiation and minimizes the energy used for air conditioning. The architects conceived the “unused” space of the project as public space or infrastructure that connects urban commuters and draws them towards “server spaces” such as art galleries, convention centers and concert halls. The entire development will link to the rest of the city’s Business District and infuse the street level with fresh, vibrant content. A VRV climate control system is designed to save up to 40% of the total energy compared to traditional office buildings in Santiago. Focusing specifically on the worker activity, the architects made sure each part of the work day is improved through a connection to nature – from a meeting room to an outdoors lunch break. 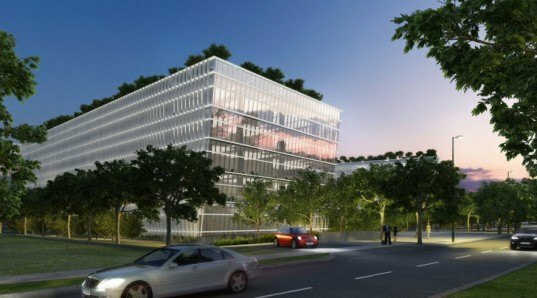 This impressive building is in the process of being LEED certified. The architects conceived the “unused” space of the project as the public space. The infrastructure connects urban commuters and draws them towards “server spaces” such as art galleries, convention centers and concert halls. The entire development is supposed to connect to the rest of the city’s Business District. The project will infuse the street level with fresh content. The building is in the process of getting a LEED certification. With a VRV climate control system designed to save up a 40% of the total energy compared to traditional office buildings in Santiago. Focusing specifically on the activity of work, the architects made sure each part of a person’s work day is improved through a connection to nature-from a meeting room to an outdoors lunch break.